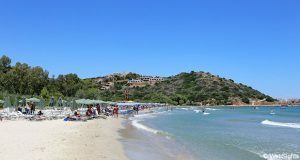 The palm beach of Vai is located in the north-east corner of Crete. From the capital, Heraklion, there are 153 km by car, and the trip takes approx. 2,5 hours. Vai is an almost 300 m long natural beach, which is located right in front of an exotic palm forest. With its approx. 5000 palm trees, it is the largest palm forest in Crete. The sand is fine-grained and golden, but mixed with pebbles in the northern end. The water is crystal clear with beautiful turquoise shades. The beach has all the necessary facilities, including sun lounges, sunshades and showers. 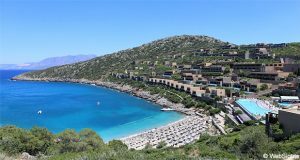 The palm trees and the beautiful sand beach make Vai one of the most popular tourist attractions in Crete. The beach is particularly quite crowded in July and August. On some days, it may be a bit crowded to play, but the water is relatively shallow and there are rarely waves. There is a wide selection of water sports activities at the beach, including jet skis, banana boat, water skis and windsurfing. At the southern end of the beach, there is a restaurant/café, which is also a beach bar. The prices are reasonable despite the lack of competition. The closest big town is Sitia, which is located 25 km to the south-west. However, the number of hotels is limited here. The closest large holiday resort is Agios Nikolaos, which is located almost 100 km to the west.